A sure sign that spring is on the way when this large interesting shrub’s buds begin to swell in January. First white, then silver and finally open sesame fragrant golden yellow. Its a fascinating procession. 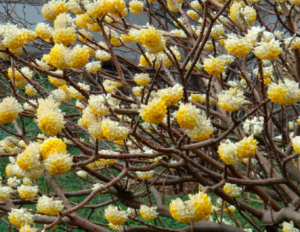 Large deciduous shrub with sweetly fragrant late winter flowers. Best in light shade with a bit of overhead protection so a late freeze doesn’t wreck the show. Truthfully, that rarely happens. Light shade and well drained, somewhat enriched soil. Overly rich soil can lead to a host of problems among which are fungal root diseases and rank huge growth which shortens the shrubs lifespan and leaves it vulnerable to tipping. Average soil- steady as she goes and regular summer water. Fascinating Daphne relative native to China thats been cultivated for so long its actually naturalized in Japan and is considered weedy. Ah, well. We still love it. Forms a framework of several trunks and then suckers like crazy. Do not prune the top half of this shrub- not that there is any legit reason too. It HATES being pruned. Remove the suckers and plant them around your yard. Have a whole freakin forest of this plant once used to manufacture paper. Size depends on the fertility of the soil.